I am a graphic designer, editor and writer who specializes in publications. My 40-year career has included stints as Art Director at a small printing firm, Assistant Art Director at an advertising agency, and Production Manager at both a national advertising agency and a large national printing company. In 1980, I forged out on my own and never looked back. I owned and operated a successful full-service design studio in San Antonio, Texas, from 1980–1992. In 1993, I moved to Seattle, Washington. As the owner of Communicating Words & Images, I work with publication clients from the corporate and non-profit worlds. I also write a blog under the moniker: The Green Queen of Moderation—living an imperfectly sustainable life. The Green Queen shares tips and promotes ideas for sustainable living without going to extremes. Topics include the "re" words (recycling, repurposing, etc. ), the green garden, green living, and simple gifts. My interests include gardening, photography, knitting, music of all kinds (I sing), theater, science fiction, and everything about the natural world. Two years ago, I received certification as a Master Urban Naturalist via The Audubon Society. I spent the day incorporating some of the feedback from our last class. The website is live and ready to view here at thegreenqueenofmod.com. I’d love to hear what you think about it! If you like what you see, follow me on Twitter for tweets on a variety of topics on sustainable living. This entry was posted in Assignment on 13 March 2014 by Andrea Leigh Ptak. 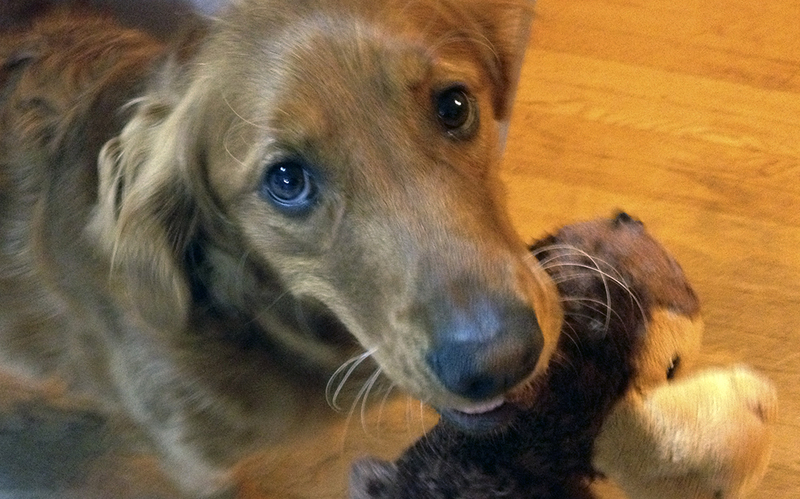 This entry was posted in Projects and tagged dog toys, green, repair, sewing on 4 March 2014 by Andrea Leigh Ptak. February is a very busy month for me work-wise. Self-employed, I have a couple of publications in the shop and am also working on my taxes. So, my recent posts this month are on topics that I already had the elements needed. This one, about why it’s a good idea to “bring your own bag” when you shop, is an example of the type of post I can do when I’m busy with the rest of my life. This entry was posted in Projects on 23 February 2014 by Andrea Leigh Ptak. This entry was posted in Assignment, Projects on 23 February 2014 by Andrea Leigh Ptak. …One Book at a Time. This entry was posted in Assignment and tagged books, POD, self publishing, writers on 23 February 2014 by Andrea Leigh Ptak. The Espresso website gives all the basic info on printing your self-published book on demand, but it seems you need to connect with the individual outlets for your cost. The UW offers all the pre-press services you need, but again, you’d need to connect with them about cost. At this point, it seems like a good option for obscure academic subjects, family vanity projects (cookbooks, history, memories), but not so much for someone trying to reach a mass market. It depends on your goals for your book. This entry was posted in Resources on 23 February 2014 by Andrea Leigh Ptak. I found this site, “Social Media Examiner,” with a simple Google search. Their 5 Steps to Insure Your WordPress Blog is Secure is straightforward. Kathy has covered steps 1–3 well in class. I’d like to hear her thoughts on steps 4 & 5: backing up our blog database, and installing a “Limit Log-in” plug-in. This entry was posted in Resources and tagged blog, security, wordpress on 9 February 2014 by Andrea Leigh Ptak.